This morning I made a remote presentation to a Presidential Committee on innovation in an East African nation: any industrialization policy based solely on China and India models will struggle in the age of AI (artificial intelligence). The country has an evolving strategy to mirror China and to a large extent India in its industrialization policy. In an extensive brief, I made it clear that we have a major dislocation which would make it challenging for any country to replicate China and to a small extent India on the path to industrialization. The issue is AI which will create a massive shift in how products and services of the 21st century are developed, manufactured and distributed. A farm in England has no single farmer, from planting the crops to harvesting them. Just after sunset on Sept. 6, 2017, celebrations erupted on a farm in the quiet county of Shropshire, England. After a year of hard labor and careful planning, researchers achieved the previously impossible: the world’s first fully automated harvest — from barren land to flourishing crops — had been successfully completed. The “Hands Free Hectare” used nothing but robots, and was yet another step forward in revolutionizing how we feed the world. About 35 years ago, during the arising of China, labour was a major cost element in manufacturing (that remains today though knowledge is evidently the most important factor of production now), China did all necessary to use its massive population to offer competitive and comparative advantages for companies to outsource manufacturing to them. China manufactures the world and that position cannot easily be taken away from it, even as labour cost rises in the nation. India has been the world capital of lower end software services. India’s gifted English-trained graduates continue to play major roles in software solutions around the world. English is the language of commerce and software is “eating” the world. India has played major roles, largely at the tactical and operational levels of building and distributing software. Yet, to a large extent, the core strategic level remains only to America as the best software companies are Americans, even though India has contributed extensively to what those companies do. AI is the next frontier, and to a large extent, America and China will own this AI future. Labour productivity improvements will drive initial GDP gains as firms seek to “augment” the productivity of their labour force with AI technologies and to automate some tasks and roles. For both China and India, the AI world will bring major shifts as AI will do most of the things Indian software testers, telemarketers, etc do today. In China, AI is going to power many elements of manufacturing in coming years. So, by 2030, I expect many of the outsourced jobs which have moved to India and China to return back to the Western world. But China is lucky – it is a continent of itself. India is also lucky, it is huge itself. Separately, they have smart tax policies which will help them keep what they have today. Try to import ICT equipment into India and see the duties. Do the same in China, you will cry. In these nations, they are wired to allow you to import from them but not to export to them. With massive population (each more than the combined population of Africa), they have the numbers for their native companies to thrive at scale. For Africa, the challenge is to find a way to leapfrog what China did on cheap labour. But that would be challenging as most factory works will be done by AI in coming years. So, I do expect even China to lose most of those factory jobs as Western companies bring them back home where AI will do them. So, for Africa, factory jobs will not be the path for us to win the opportunities of the future. 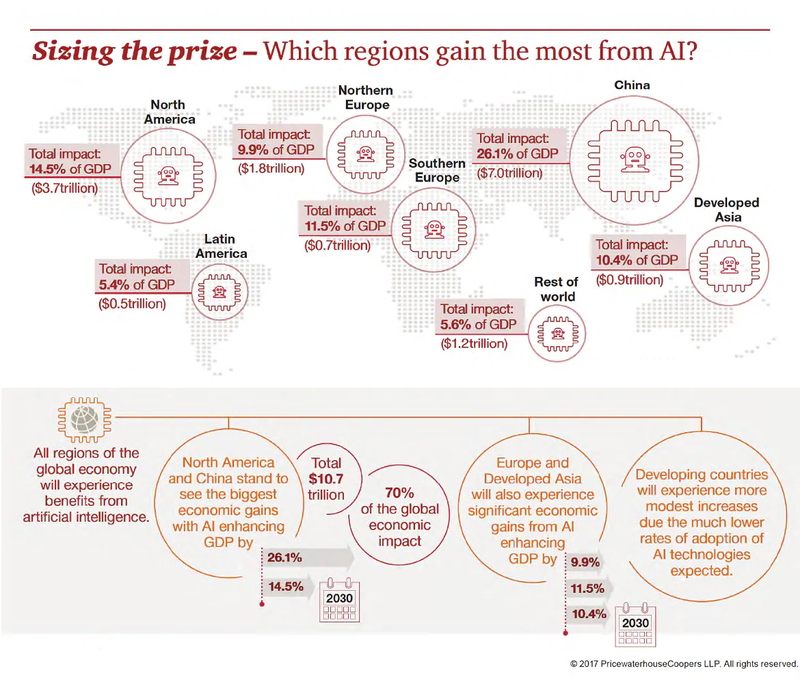 We need a new game plan because AI is providing better competitiveness more than any nation can offer to global multinationals. Yes, great educational system on mathematics, physics, engineering and broad science will be required. So, instead of thinking you can be fine with the largely (poorly educated) cheap labour, you must be thinking how to have top-grade graduates who can compete against the best. Competition is now global because Internet scales any idea without any constraint. China has understood this redesign and is already working – it is winning with brain power and capabilities. As former Google Chairman, Eric Schmidt, noted, Internet could be divided into two: one dominated by U.S. and another by China. These are the world’s premier AI empires of today. Africa needs to find space at that top level because the old easy hanging fruit will be “eaten” by AI in coming years. Africa cannot just wait to do the easy jobs as it marches towards industrialization. Most things would be automated and AI would add intelligence, making them better. Out driving force from the developing world must be to leapfrog the more developed economies, and take the heat to them (think of MPESA evolution in Kenya). Because what worked for China and India will likely be disintermediated by AI, our only developmental paradigm in Africa is to move upward where higher values are usually created. Africa will find massive opportunities at the upstream. AI could contribute up to $15.7 trillion1 to the global economy in 2030, more than the current output of China and India combined. Of this, $6.6 trillion is likely to come from increased productivity and $9.1 trillion is likely to come from consumption-side effects. The factory jobs of the future will not cement our future. We have to position, and to innovate at our own levels, and build local capabilities. By innovating, we create new basis of competition, making even some Western World systems and processes obsolete, as MPESA made every digital payment system in the world. There is a huge opportunity across industrial sectors to pioneer new ways. We can only do those by pushing higher because if we just think cheap labour will take us where China and India are seated, AI, our biggest competitor today, may make that difficult. A case of struggling/fighting so much to learn/implement what is already obsolete; pitiable and dismal at the same time. We still have an education system wired for ‘civil service’ jobs, the old famed whiltecollar jobs. And young boys and girls compete to gain admissions, only to graduate and then realise that there’s a sort of dislocation or misalignment somewhere. Added to the chaos is that often used and misused ambiguous phrase: international best practices, which when examined critically, you discover that it’s just a ruse. No such thing as ‘international best practices’ in a world where peoples think and live differently. Therefore, the ‘best practice’ would be to look at your own history, what works for you, then going ahead to standardise and codify them, with clear intention to continuously evolve them, as present and future realities dictate. Amidst the chaos/dysfunction, we haven’t done much in taking care of simpler things like road construction, power supply, and that of treating simple ailments. The problem with copying someone is that it denies you the opportunity to THINK and effectively utilise where you have comparative advantages; now we are fighting to emulate or copy what the big boys will soon toss. This is an excellent write-up no doubt, however, chasing after AI at this stage would be like having leprosy and ring worm; you left leprosy and you are curing the ring worm. Most African nations cannot bost of supporting their current power needs, how are they going to support automation? African nations are leaving on loans to build their roads and bridges, who is going to fund the AI projects? Their competitors? Dr Jobi – thanks for the insight. Actually, I did not say that Africa must chase AI. I only said that AI would disintermediate the current developmental model. The upstream I mentioned is not about AI but deepening capabilities in fundamental science. We do not need to chase AI because you need capabilities to do so but we must elevate our fundamentals to have capacities to evolve new developmental processes.